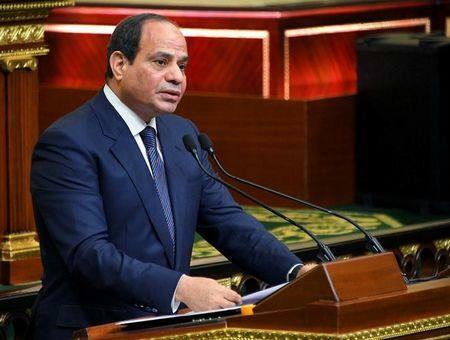 CAIRO (Reuters) - An Egyptian court said on Monday it would seek the death penalty for eight alleged Islamist militants including two accused of plotting to kill President Abdel Fattah al-Sisi and a former Saudi crown prince, judicial and security sources said. The military court will transfer the case to Egypt's top religious official, the Grand Mufti, whose non-binding opinion is required before executions can take place but who rarely challenges court decisions. The eight are among a group of nearly 300 people accused of belonging to Islamic State, some of whom plotted to kill Sisi in Egypt by targeting his motorcades, judicial sources have said. Two of the eight for whom the court is seeking capital punishment planned to target Sisi at a Mecca hotel where they mistakenly thought he was staying in 2014, and to plant a bomb to distract security forces while they targeted Sisi and the then Saudi Arabian Crown Prince Mohammed bin Nayef, judicial and security sources said. The eight were tried in absentia. Of the 292 suspects, 151 are in custody. A court date has been set for March 6 following the Mufti's decision, when all 292 defendants will be handed sentences. Those in custody will then have one chance to appeal against the sentences. Those tried in absentia will be retried if they turn themselves in or are captured. Since 2013, Egyptian criminal courts have issued hundreds of death sentences, although only a small proportion have been carried out.